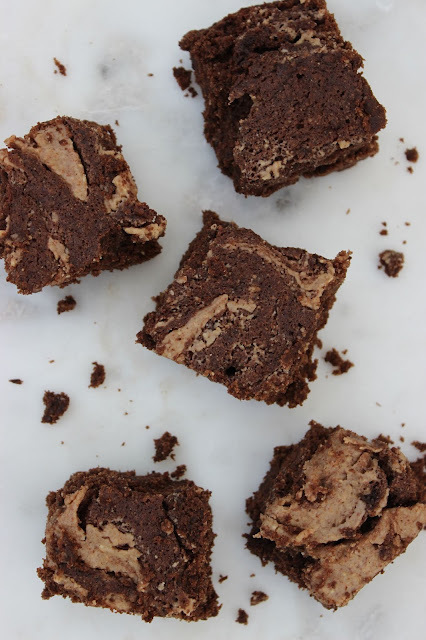 It's been ages since I last shared a brownie recipe with you- but what better comeback than these indulgent brownies complete with peanut butter swirl. They're just soo good and might just be my favourite brownies yet! I've tested these out on friends who don't follow this way of eating and they loved them too so I've been so excited to share this recipe with you! 1) Start by making chia "eggs". Mix the chia seeds with 6 tbsp water and set aside for 15 minutes, until a gel forms. 2) Preheat the oven to 180 degrees C. Line an 8 inch square cake tin with baking paper. 3) In a mixing bowl, whisk together the maple syrup, coconut oil and 1/4 cup of the peanut butter, along with the vanilla. 4) Stir in the chia "eggs". 5) In a separate bowl, mix together the buckwheat flour, cacao powder, baking powder and salt to combine. 6) Add the dry ingredients to the mixing bowl and stir thoroughly to combine. 7) Pour into the prepared cake tin (it'll be a fairly liquid mixture) and spread evenly. Using a spoon, dollop the remaining 1/4 cup of peanut butter in 5 or 6 spaces on top of the brownie mixture. Use a knife to run through the mixture and create swirls, taking care not to over mix and lose the effect. 8) Bake for 20- 25 minutes until a skewer inserted into the middle comes out clean. Allow to cool in the tin for at least 15 minutes before slicing.